Each author will read from her recent works. This event is free and open to the public and books will be available for purchase. Evie Shockley is the author of two books of poetry — The New Black (2011), winner of the 2012 Hurston/Wright Legacy Award in Poetry, and A Half-Red Sea ( 2006), and a critical study, Renegade Poetics: Black Aesthetics and Formal Innovation in African American Poetry (2011). Her poetry and essays appear in journals and anthologies, with recent or forthcoming work included in Best American Poetry, FENCE, Obsidian, and Cambridge Companion to Modern American Poetry, among others. Her work has been honored and supported with the 2012 Holmes National Poetry Prize, fellowships from the American Council of Learned Societies (ACLS) and the Schomburg Center for Research in Black Culture, and residencies at Hedgebrook, Mac-Dowell and the Millay Colony for the Arts. Asali Solomon received a Rona Jaffe Foundation Writers’ Award for the stories later collected in Get Down, her first book, which was a finalist for the Hurston/Wright Legacy Award for Debut Fiction. In 2007, she was named one of the National Book Foundation’s “5 Under 35.” She teaches English literature and creative writing at Haverford College and is a former member of the W&L faculty. Her latest book, Disgruntled (2015), was the subject of a recent segment on Fresh Air on National Public Radio. Helena Maria Viramontes is the author of The Moths and Other Stories and two novels, Under the Feet of Jesus and Their Dogs Came with Them. She has also co-edited two collections Chicana Writes: On Word and Film and Chicana Creativity and Criticism. She is completing a draft of her third novel, The Cemetery Boys. A recipient of numerous awards and honors, including the John Dos Passos Award for Literature and a United States Artist fellowship, her short stories and essays have been widely anthologized and her writings have been adopted for classroom use and university study. Her work is the subject of a critical reader titled Rebozos De Palabras (2013). I am a mestiza. Half Indian, half white. Half poet, half academic. Split between the East and West Coasts of the North American continent, I have spent most of my life negotiating the complexity of in-betweenness, a place where the work of my scholarship often clashes with the work of my heart’s passion. Research demands facts, precision, efficiency, respect for deadlines, while poetry demands a suspension of time, ambiguity, messiness, irreverence for rules. As Chicana scholar and poet Gloria Anzaldúa writes, the borderlands are “not a comfortable territory to live in, this place of contradictions … A borderland is a vague and undetermined place … it is in a constant state of transition.” Is it possible to create a true mestiza work out of these two beloved but very separate cultures? To conceive and give birth to a mixed, hybrid, generative and balanced creativity? What would this kind of research look like? What would this kind of poetry look like? Is it possible to create this new kind of space in the in-between, and how would one keep one’s balance on constantly shifting ground? Anzaldúa warns that, “To survive the Borderlands/ you must live sin fronteras/ be a crossroads.” This talk is a map of surviving that encounter, that clash, and all its glorious consequences – in a body, a life, and a career. 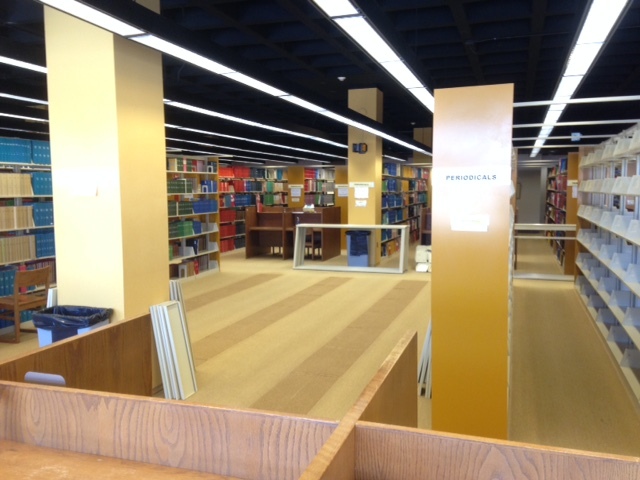 In the never-ending pursuit of space in which students can work, we are in the process of removing some shelving on Lower Level 1 in order to create a couple of seating areas. Within the next few weeks, we should have some tables and chairs in these spaces. And, eventually, we will get some electrical outlets, but not quickly. Questions and comments should be directed to Access Services Librarian Elizabeth Teaff. The good news is, the February break is almost upon us. The bad news is, it still will be winter after the break ends. For many years, two of the most venerable voices of international cultural and political criticism have been The Economist and the Times Literary Supplement. Indeed, Washington and Lee University has subscribed to both weekly publications for at least half a century. Now, because of recent acquisitions by the University Library, W&L readers have online access to the entire historical archive of each publication. The Times Literary Supplement, known to readers around the world as TLS, speaks knowingly of its legacy when it says, “Since 1902, the Times Literary Supplement has scrutinized, dissected, applauded, and occasionally disparaged, the work of the twentieth century’s leading writers and thinkers.” One gets a taste of the publication’s erudition in a 1982 critique of the “new journalism.” TLS‘s critical mission continues unabated in the 21st Century. The Economist is an even longer-lived icon, beginning publication in 1843, presenting “timely reporting, concise commentary and comprehensive analysis of global news every week.” Consider this, from an article in the 16 November 1918 issue: “That such a war should have been the only means by which they could settle their differences is a sufficient proof that the civilisation under which we lived until 1914 was a mockery.” Contemporary coverage from The Economist continues to be valued by W&L faculty and students for its intelligent and literate analysis. Washington and Lee’s acquisition of these valuable online resources was made possible by generous gifts to the University Library. The TLS is being provided by the Elizabeth Gray and Marvin Banks Perry Memorial Fund, while The Economist is supported by a bequest from Mary W. Hilliard and funds from the Henry P. Johnson, Jr. Endowment. We are deeply grateful for these gifts, which will enrich W&L for many years to come. The expected arrival of what media are sure to call the Washington Birthday snowstorm (or snow event or whatever) is forcing the cancellation of our visit from the Therapet dogs on Monday 16 February. We don’t want the puppies riding on I-81 while snow is falling, do we? Cold, stressed, tired of winter? On Monday 16 February from 2:00 to 4:00 in the afternoon, we will have another visit from Therapets of the Roanoke Valley, this time featuring four — count ’em, four — friendly canines. The dogs will be winning friends and reducing stress in both Leyburn Library and Telford Science Library, so stop by and spend some time with a furry face that really doesn’t judge you, no matter what your GPA might be. Members of the Washington and Lee community who want to use images — photographs, maps, charts and graphs, works of art — in their research are invited to investigate the University Library’s new Finding and Using Images guide. The guide addresses issues such as available editing software and appropriate sources and uses for images. If you have questions, feel free to contact Instructional Design Specialist Emily Cook. Members of the W&L community are invited to join the members of the Copyright Interest Group (including representatives from W&L libraries, ITS, and the Office of General Counsel) for some practical advice and resources on protecting your intellectual property rights when publishing. Feel free to bring your lunch. After the session, the Group will post Q&As and a summary of key points from this brown bag, as well as the prior session on copyright in the digital age from November. Here is additional information about Professor Murdock’s presentation.